Salahi Deli’s new sign has a deeper backstory. Justin Mitchell/Bklyner. 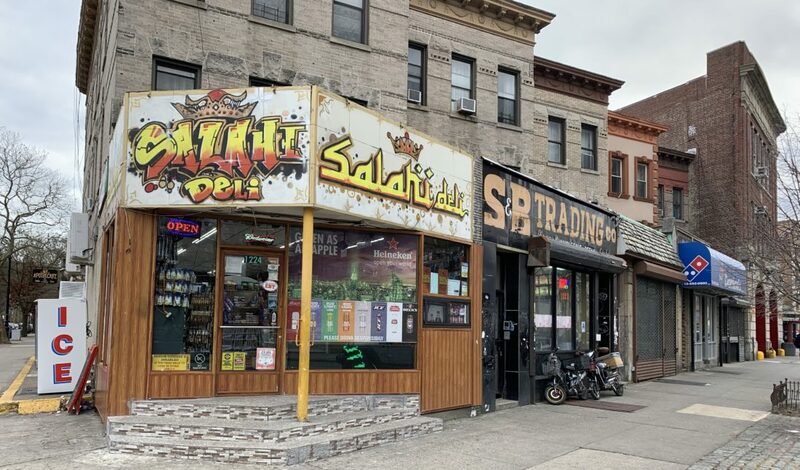 BROOKLYN – A local business in Ditmas Park got an eye-catching new look last week, when Salahi Deli substituted the awning it had used as a sign for almost three decades with a graffiti-style design painted directly onto its building at Cortelyou and Argyle Roads. But there’s more to it than whimsy. 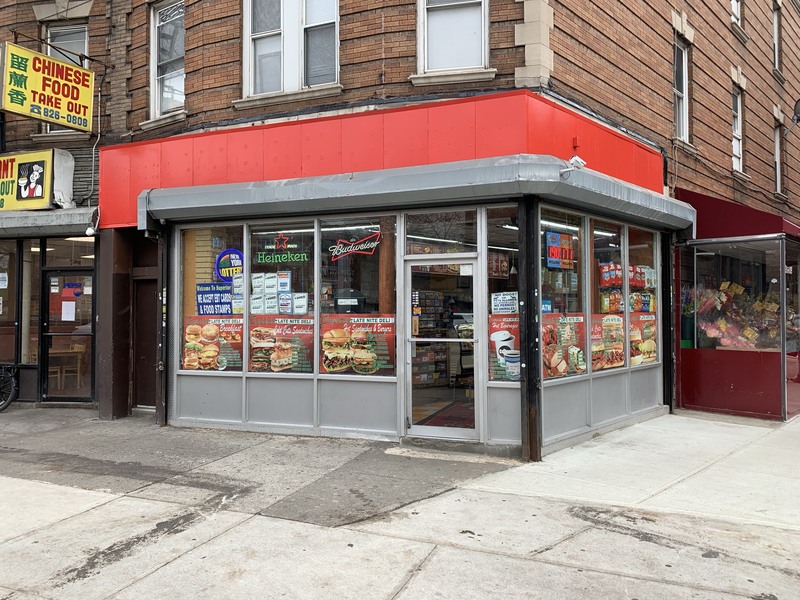 Manager Mohamed Salahi said the change came after a warning from the people who run Superior Late Nite Deli a block away, who said they received a $6,000 ticket for their sign. “They told us to take it down, it’s not worth it,” Salahi said Wednesday. 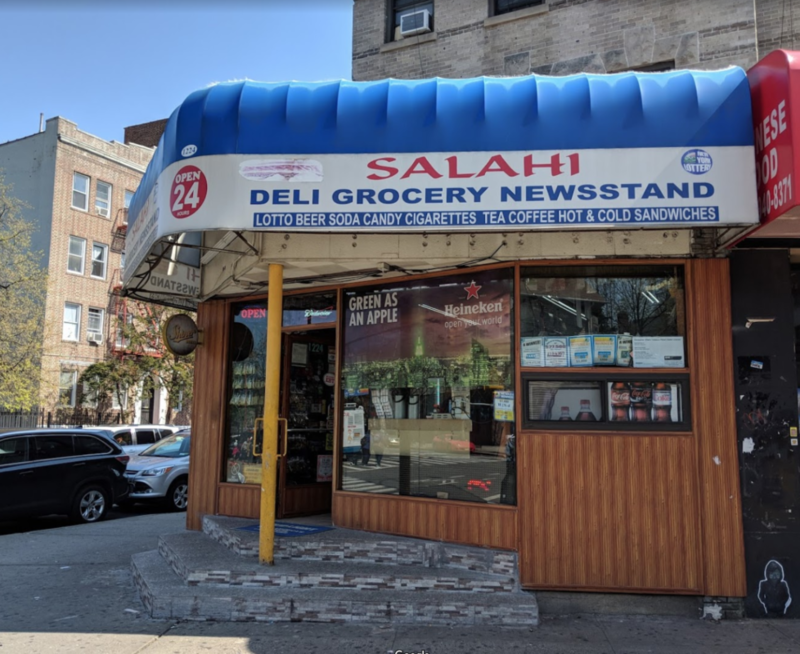 Salahi has worked at Salahi Deli for about twenty years. His brother started the business in the early 90s. They had never had any problems with their awning until this dire news from up the road put them and other local business owners on alert. In the last several weeks, Kumo, a Japanese restaurant next door to Superior, also changed its outside awning. San Remo, a pizzeria next to Kumo, did the same, ditching its awning in favor of a sign. Cortelyou Road businesses before the signage panic. Google Street view June 2018. Jerry Teng, Kumo’s manager, said Superior’s ticket plus news of other businesses getting cited motivated him to make the change. “I didn’t want to pay $6,000, so I just took the sign off the outside,” he said, adding he’s heard the total charges, which include installing a new sign, can get as high as $10,000. Matt Trunzo, the manager at San Remo, said the owners of that restaurant were already in the midst of re-designing their sign, but hastened the process after Superior Deli’s experience. The man working the counter at Superior Deli Wednesday said the owners were currently out of state on vacation. This same drama is playing out on blocks across Brooklyn, Queens, and Manhattan in recent months, as businesses face sudden and unexpected fines for signs and awnings they have used for decades. That sparked an impromptu online meeting of council members sharing similar issues from their districts. 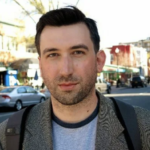 Among those chiming in was Rafael Espinal, who represents parts of Bushwick, Brownsville, Cypress Hills, and East New York, saying he had a bill to deal with the issue. I have a bill to stop this madness. It Happened in ENY a year ago. Sign on bro! Press conference happening soon. Caitlin Kelmar, Espinal’s legislative director, told Bklyner in a phone call that for a time, the New York City Department of Buildings had a moratorium on issuing fines concerning signage. The moratorium was passed in 2003 and lasted until 2006. It came amid a similar surge in citations for awnings, with some calling them an eyesore that decreases foot traffic. Businesses used to receive a series of different violations from DOB for non-compliant awnings. After the moratorium lapsed, former Mayor Michael Bloomberg cut them down to a single “work without a permit” violation to lessen the burden on merchants. But Espinal’s office said that single “work without a permit” violation has itself become more expensive in recent years, putting the hurt on businesses. Kelmar said none of Espinal’s constituents they have heard from were aware they were in violation until cited by DOB last year. “And so all of the sudden DOB has been doing sweeps in Brooklyn, Queens and Harlem that we’ve heard of so far, and issuing these massive fines which are normally around $4,000 to these small businesses, saying they’re violating a law that these businesses didn’t even know existed,” she said. Awnings must be at least 8 feet from the sidewalk, extending no more than 4 feet from the building, and have letters no higher than 12 inches, and can only spell out the business’s name and location, but no phone number. Based on pictures of Salahi Deli’s old awning, it was likely in violation. The resource also says signs painted onto the surface of a building and non-illuminated signs that fit within 6 square feet require no permit, while any oversized or illuminated sign, such as the one formerly at Superior Deli, does. These regulations can vary based on zoning. 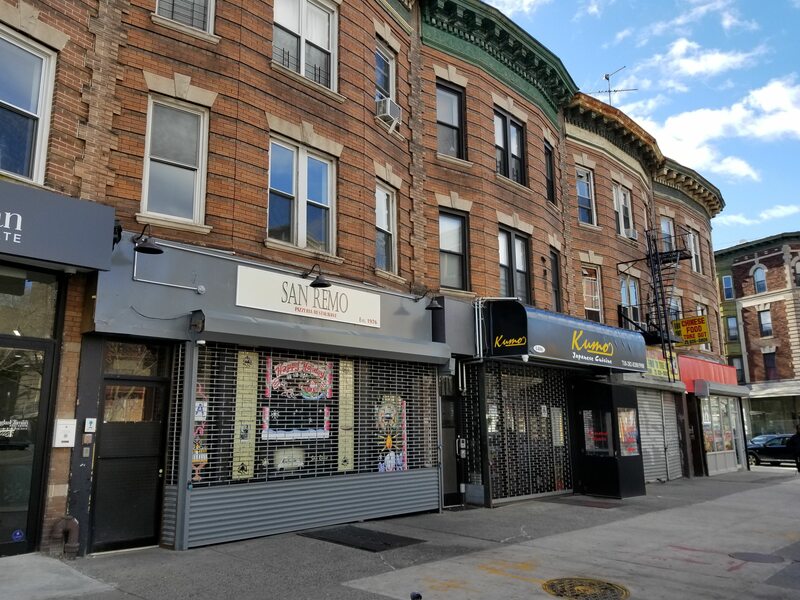 Espinal is preparing a bill that would institute a new moratorium on fines while DOB and Small Business Services do more outreach to inform business owners of the laws, and would also like to provide assistance to businesses like Superior Deli, which have already been fined. Kelmar said Espinal’s office is negotiating with the office of Mayor Bill de Blasio about the best way to do this, and has a press conference planned for the first week in December with Brooklyn Borough President Eric Adams and several council members hoping to pressure the Mayor’s office on the issue. None of this accounts for what appears to be a sudden and recent spike in reports of improper signage and the city-wide scramble to adjust. Kelmar said that while Espinal’s office has been getting complaints about this for about two years, it seems to have grown exponentially in recent months. “One of these sign companies called us and told us that he thinks one of his competitors is like kind of going down a list of businesses all on one street, reporting all of them, and then giving them all his flyer,” Kelmar said. A document available on the DOB’s website lists only 43 companies city-wide licensed to do this work. Kelmar provided Bklyner a chart of calls to 311 about awnings in both Queens and Brooklyn. It shows dozens of reports of awning violations grouped close together over a short period of time, dating back to late last summer, sometimes listing adjacent buildings. The Department of Buildings said they are not doing any “sweeps” of businesses, but instead responding to complaints. In the case of Superior Late Nite Deli on Cortelyou Road, the Department said they received a complaint about the sign in June and inspected it at the end of July, finding it in violation. The DOB said it does not decide the amount of fines for these violations, and said a judge at the Office of Administrative Trials and Hearings (OATH) fined the business only $625, not the $6,000 neighbors appear to widely believe. Public online records seen by Bklyner confirm this. The Department also said Superior had not yet submitted a Certificate of Correction for the issue, and faces a December 3 hearing for that. They also provided this link for information on how businesses can install a legal sign at their place of business. Kelmar said the DOB needs to do a better job of warning business owners before fining them. Update at 12:15 pm – to reflect that there was no change in regulations for awnings following the end of the moratorium in 2006, but instead a change in how businesses were fined for violating those regulations. Thanks, Jack! It seems to be literally just about every commercial stretch. So this begs the question: Why are the sign companies allowed to create awnings that will get their clients fined? Shouldn’t they be required to stick to the regulations and inform their clients that their proposed designs are a DOB violation? So wait: The fine was $625, not $6,000? Is that the maximum fine set fine for a sign violation? If the DOB doesn’t determine the amount, who does? Each individual OATH judge? Why did Superior claim it was $6,000?